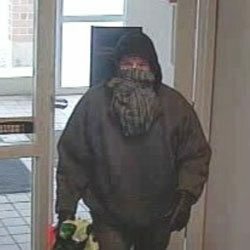 Chicago, IL-(ENEWSPF)- A bank robbery occurred earlier March 14 at the Fifth Third Bank branch located at 1N111 County Line Road in Winfield, Illinois. The robber, described by witnesses as a male/white with dark eyes, approximately 5’11” tall, 30 to 40 years of age, was well-covered at the time of the robbery. He wore a dark hat, dark coat, black gloves, and a bulky black and gray scarf that covered most of his face. The robber approached a teller around 11:50 a.m. and made a verbal demand for money. He fled the bank with an undisclosed amount of cash. There was no weapon displayed or threatened, and no injuries were reported. A surveillance photo is below. Anyone with information about this robbery is asked to contact the Chicago Field Office of the FBI at 312-421-6700, or local law enforcement.